This is a guest post from the NWT Chapter of the Council of Canadians that was originally published on their website. Since the Northwest Territories leg of our 'Damming the Peace' tour was held, the BC Supreme Court ruled against West Moberly and Prophet River First Nations' Treaty Infringement case, which means the fight against Site C continues! The decision means there will be no stop work order. It did recognize the risk of 'irreparable harm', and rule a full Treaty 8 Infringement trial needs to take place before the reservoir area is flooded in 2023. The NWT Chapter of the Council of Canadians stands with our neighbours and allies throughout Treaty 8 Territory in opposition to the Site C dam on the Peace River. We oppose this unnecessary, destructive and costly project for its negative downstream impacts, its trampling of Indigenous rights and title, and threats to food sources and water. We are downstream from the Site C dam and want to do our part in calling for its cancellation, so we invited expert and activist Wendy Holm to the NWT from October 7-13, 2018 to build relationships and raise awareness about the impacts of Site C. You can read the CBC's reporting on this speaking tour here. Wendy is a Professional Agrologist, agricultural economic and public policy expert, and editor of Damming the Peace: The Hidden Costs of the Site C Dam. Site C is a proposed 60-metre high, 1,050- metre-long earth-filled dam and hydroelectric generation station on the Peace River in Treaty 8 territory. It would create an 83- kilometre-long reservoir that will flood 15,985 acres of agricultural land; destroy traditional hunting and fishing areas; and submerge 78 Indigenous heritage sites, including burial grounds and places of cultural and spiritual significance. Mother Earth is also fighting to stop the dam as evidenced in the recent landslides in the area. But we can all work to stop Site C. Here are five of the reasons we all need to step up to stop this dam. Site C will destroy critical hunting, fishing, cultural and burial sites of Indigenous communities in the Peace Valley and downstream from the project and forever alienate some of these communities from their homelands. As put by Julian Napoleon, a Dane-zaa and Cree food sovereignty researcher, "Site C continues an ongoing legacy of cultural genocide." The dam will flood invaluable alluvial soils and farmland with the capacity to meet the nutritional requirements of more than 1 million people a year forever. Since we live so close to the Peace Valley, this loss will impact food security and nutrition in the NWT. Already, two-thirds of the drying of the Peace Athabasca Delta which supports Wood Buffalo National Park, a UNESCO world heritage Some of the crowd out for Wendy Holm's Brown Bag Lunch Site C Presentation in Yellowknife Meeting with Shane Thompson MLA for Nahendeh whose constituents are directly impacted by upstream dam projects. site is the direct result of the existing dams on the Peace River. Site C will make things much worse. Site C will further disrupt seasonal water flows, destroy downstream ecosystems and habitats, and kill fish and wildlife in the Peace-Athabasca Delta and the Wood Buffalo National Park. Site C’s untested dam design in a geologically unstable area influenced by fracking related earthquakes poses a serious risk to downstream communities. Meeting with Shane Thompson MLA for Nahendeh whose constituents are directly impacted by upstream dam projects. After flooding, decomposition processes will create poisonous methyl mercury which will bio‐accumulate in the aquatic food chain, poisoning fish and those whose diet relies on fish for two to three generations. Site C is part of an agenda that first surfaced back in the 1950s when the US Army Corps of Engineers was tasked by Washington to make sure Americans never run out of water. The Peace River is the only route to bring northern water (diverted from rivers flowing to the sea) into the central Midwest because it is the only west to east breach in the Rocky Mountains. As Wendy has noted, NAFTA (and now the new USMCA) strips Canadian sovereignty over this precious resource. Once BC Hydro is privatized, as it will be after building the over-budget Site C dam, US investors will have unfettered access to the water impounded behind it. 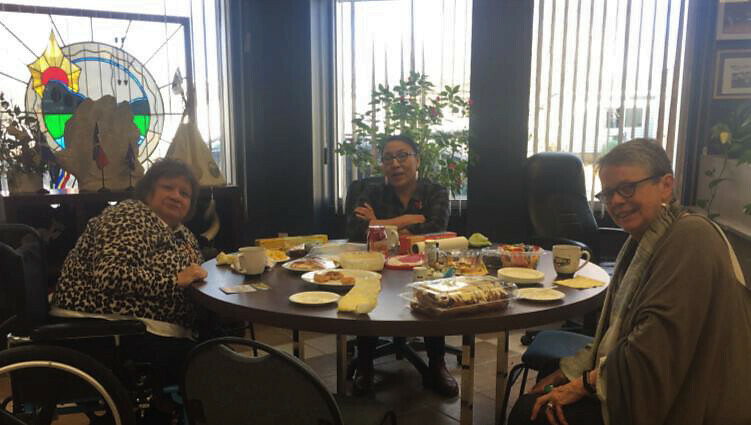 During her visit to Denendeh (Northwest Territories), Wendy traveled with Amy Lusk of the Slave River Coalition to Thebacha (Fort Smith) and Deninu Kue (Fort Resolution). While in those communities, Wendy made public presentations and met with community members. 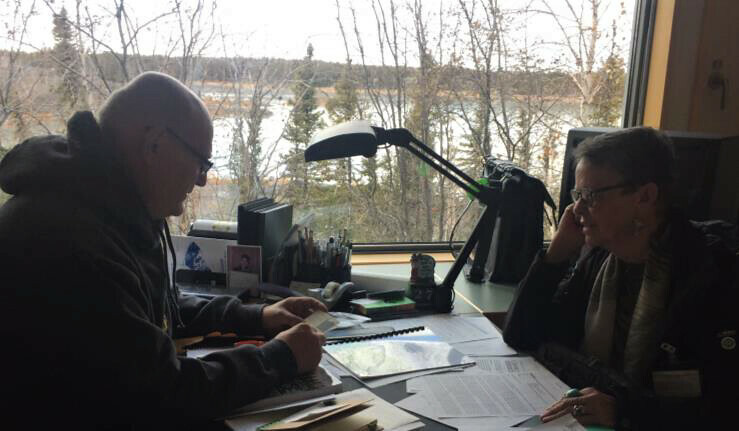 In Yellowknife, Wendy met with several MLAs and some Dene Nation staff, led a public presentation, and was a guest on CBC North’s Trails End radio show. Jennifer Broadbridge with Ecology North said that Wendy “is a very effective and passionate speaker and (she) learned a lot from her presentation.” Many people in the communities Wendy visited shared this view. We are grateful to the Slave River Coalition and Ecology North for their partnership on Wendy’s visit and to Kevin O’Reilly for billeting Wendy in Yellowknife. You can see Wendy's full presentation here and get more updates by following Witness for the Peace and the Yellow Stake Campaign to fund First Nations legal costs.